LAB 69: GNU Screen rawks! I’ve always heard about screen before but never had an interest to read about and try. 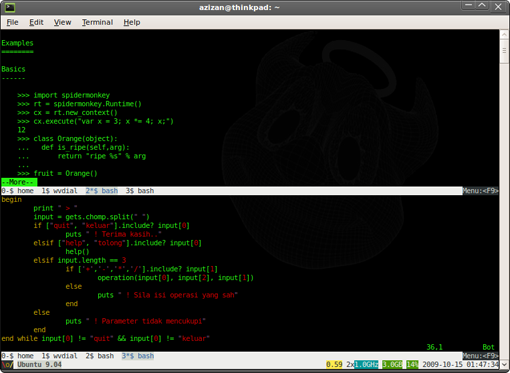 Up until recently, a friend of mine use it and it got my attention on how he manage his terminal with screen. For a person who work a lot with the terminal-based system, screen can be quite handy application for me to work with. With one terminal emulator and run screen on it, I can edit a code, run irc, connect to ssh, reading a log and etc. I can detach and reattach the screen. If i accidentally close the terminal emulator, all I need to do is open it back and resume my previously-closed screen with the same state.